Take this free NSCA Certified Personal Trainer practice exam to get an idea of the type of questions that appear on the actual certification exam. 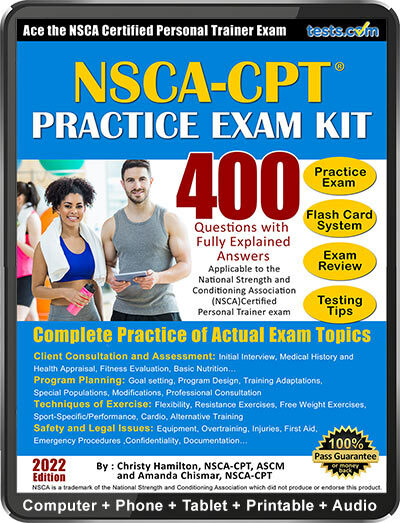 For complete practice, check out the NSCA-CPT Practice Exam Kit with 300 questions and fully explained answers. It was written by Christy Hamilton, a certified personal trainer and health and fitness writer, holding certifications as an NSCA Certified Personal Trainer and Group Fitness Instructor and an ACSM Inclusive Fitness Trainer. 1. Which of the following is a questionnaire that serves as a non-invasive, minimal health-risk appraisal designed to determine contraindications to exercise? The PAR-Q is a simple questionnaire designed to screen for readiness for low to moderate intensity training. 2. In which situation should the trainer refer the client to a dietitian? Personal trainers should refer their clients to a dietitian if the client is in a disease state. 3. What information does the Health History Questionnaire collect? b. Previous exercise history including adherence experience. c. Detailed medical and health information. The health history questionnaire collects detailed information about an individual's health background such as medications, surgeries, family history and lifestyle information. 4. What information does the Informed Consent form collect? The informed consent form is where your client acknowledges their "assumption of risk", serves as evidence of disclosure of risks and communicates the potential dangers of exercise. It does not release liability. 5. What blood pressure measurement is considered to be a risk factor for cardiovascular disease? An individual with blood pressure greater than or equal to 140 mmHg systolic and/or 90 mmHg diastolic is considered to be hypertensive, or high blood pressure, making it a risk factor for cardiovascular disease. 6. What is the correct sequence of connective tissue found within the muscle from largest to smallest? This shows the order of connective tissues from largest to smallest. Epimysium encases the muscle, perimysium acts as connective tissue between muscle fibers and endomysium encases each single muscle fiber, or cell. 7. What is the fuel source in the sliding filament theory? Adenosine triphosphate (ATP) is the fuel source in the sliding filament theory. 8. What is considered the basic contractile unit of a muscle? The sarcomere is found within each muscle fiber (cell) and contains both actin and myosin. It is considered the basic contractile unit of a muscle. Torque produces angular acceleration, while force creates linear acceleration. 10. What is the biomechanical definition of Work? Work is the product of force times the distance through which an object moved. 11. Beth is a 28-year-old woman who is looking to improve her overall fitness. How long should she rest for in between sets on a leg press exercise? A person exercising for the purpose of general fitness should rest for 30-90 seconds in between sets of a resistance exercise. 12. Abigail has been training with you for a year. She has begun seeing less results lately and is becoming discouraged. What is the best way to increase the results she is getting when she has reached a plateau and is unable to increase resistance or number of repetitions? a. Decrease number of repetitions for a short period of time. b. Decrease resistance for a short period of time. c. Increase training frequency to more days per week. d. Change the exercise modality. When a client begins to experience diminishing returns due to having reached their full genetic potential, introducing a new form of exercise will change the stimulus and force their body to continue changing. 13. What is the general idea behind periodization? a. Changing the training exercise. b. Increasing resistance by 5%. c. Exercising the appropriate muscles. d. Varying training intensity and volume. Periodization is about intentionally varying the components of training, especially volume and intensity, over specific segments of time. 14. Which training modality cannot utilize a 5% increase in training intensity as effectively? When training for hypertrophy an individual performs a large number of exercises with short recovery periods, which does not facilitate a simple 5% increase for every exercise. Therefore, when training for hypertrophy intensity increases are determined on an individual basis. 15. James has been training for and competing in triathlons for 5 years. He wants to increase running speed and cycling power. How many times should you suggest he train per week? An athlete with advanced skill like James should train no less than 4 times a week and can train up to 7 if done properly. 16. Which of the following is an absolute contraindication to stretching? While some conditions may pose slight concern and require extra consideration while stretching, a healing fracture site should never be stretched, no matter what. 17. When on the treadmill your client becomes dizzy and passes out. She hits her head on the ground. She is unconscious and non-responsive. What is an appropriate action to take? a. Go to a phone and call 911.
b. Gently move her out of the way of bystanders and prop her head with a pillow. c. Have a coworker call 911 while you stay with her. It is necessary to call 911 if your client is unconscious, but you should never leave your client. You should never move someone with a possible head or neck injury unless they are somewhere life threatening. 18. Howard is a diabetic client whom you have been training for 3 months. While exercising he begins to show signs of hypoglycemia. What is the best course of action? a. Discontinue the exercise and have Howard sit down, give him something sugary to drink and monitor him. b. Give Howard a sugary drink and continue the exercise, monitoring him. c. Have Howard discontinue the exercise and give him a protein bar and diet drink. d. Contact EMS as this is a potential life-threatening situation. You should discontinue exercise at the first signs of hypoglycemia (low blood sugar). It is not yet necessary to contact EMS. It is important to give the person something sugary to eat or drink as opposed to anything with artificial sweeteners or only protein. He should be monitored in case he loses consciousness. 19. Upon approaching a client who is unconscious and non-responsive, what should you check and in which order? The ABCs are Airway, Breathing and Circulation, in that order. This will ensure that the most life-threatening issues are addressed first. 20. You are training a client with Epilepsy and he begins having a seizure on the leg press machine. Which of the following is an appropriate action to take? Assisting a client to the ground and placing him or her in a prone or side-lying position is an option. The rest are not acceptable. There are a few organizations that offer certiciation in the field of personal training. The American Council on Exercise, the American College of Sports Medicine and the National Strength and Conditioning Association are three such organizations. To learn more about certication as a personal trainer, see Tests.com's Personal Trainer Test Guide.